This entry was posted on 19/10/2018, in Ecology and Environment, News | Newsmakers, Science and Technology and tagged Ecobrick. Bookmark the permalink. Reducing plastic waste is a huge challenge when so many products come in packaging that can’t be recycled, however the Ecobricks scheme could be the solution for households around the UK. 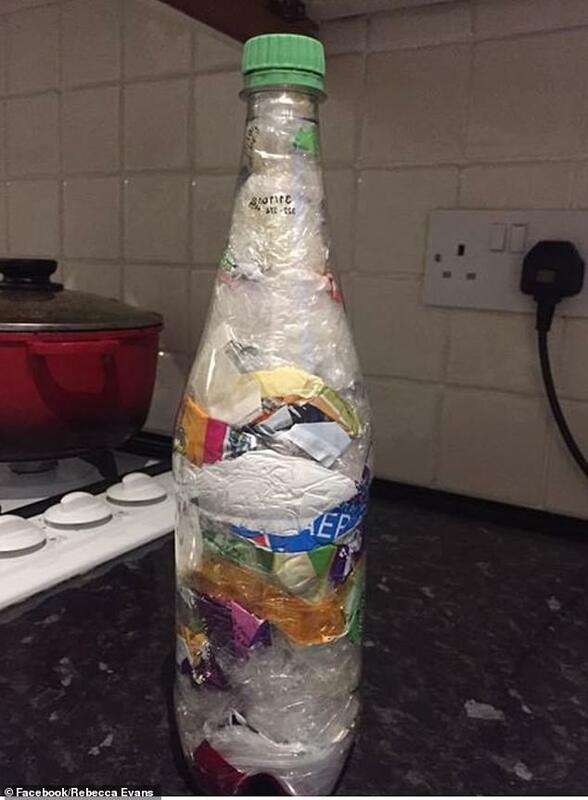 Earlier this week, a post by Rebecca Evans from Newport, South Wales went viral when she shared a Facebook snap of a plastic bottle she’s been filling with non-recyclable plastic to create an Ecobrick. The initiative set up by the Global Ecobrick Alliance Earth Enterprise encourages people to make building blocks by packing clean and dry used plastic in a bottle to a set density to create a reasuable building block. 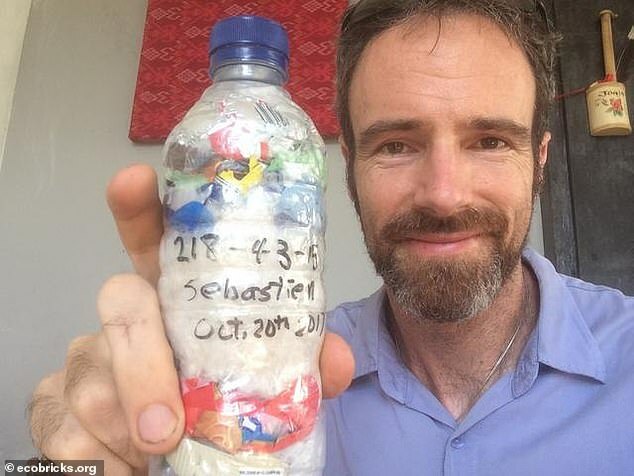 Ecobricks are popular in countries such as the Philippines, Sri Lanka and Indonesia, where they’re used in eco-friendly building projects, while in the UK they can be donated to drop off points. The movement is gaining traction with 25,000 people joning the Ecobricks UK Facebook group in recent months, and potential uses for the bricks include making modular furniture, garden spaces, walls and even full-scale buildings. 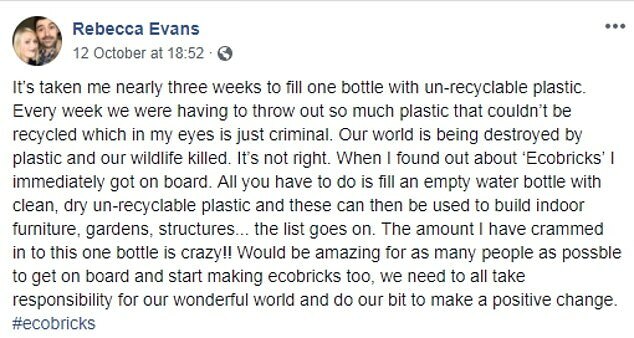 Since Rebecca posted a snap of her Ecobrick on Facebok, it’s been liked 34,000 times and shared 60,000 times, and the initiative’s website crashed because of the volume of traffic with people eager to find out how they can get involved. The movement was founded by Canadian artist Russell Maier, who developed the technique while living in Sabangan in the Philippines in 2009. He saw firsthand how plastic rubbish was being burned right next to where children played and the river where people fished, and was determined to come up with a solution. A year later a local councilor taught him a Central American technique of putting sand into plastic bottles to make bricks, and after experimenting he found that stuffing them with plastic had the same effect – creating solid and usable bricks. He’s since devoted his life to promoting the project, which has become a global phenomenon. 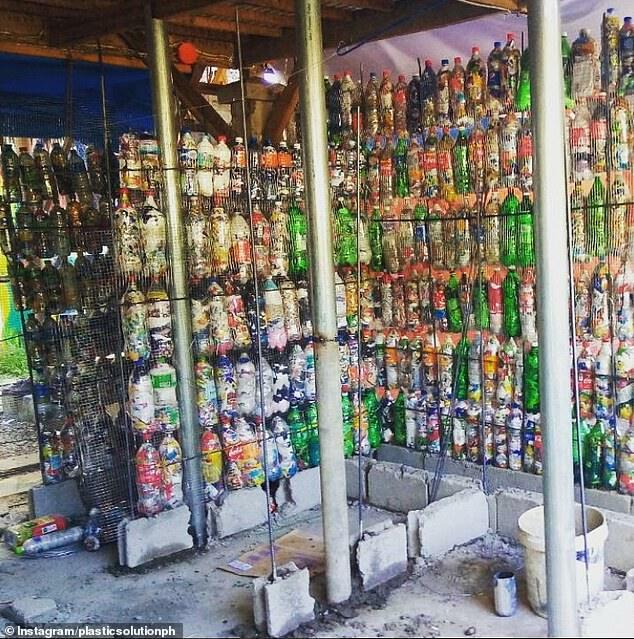 According to Ecobricks, the bottles can be connected using tire bands, silicone, cob, and cement to build build furniture, gardens, walls, playgrounds and buildings. Other suggestions include using them to build environmentally friendly pool floats and exercise equipment. Once the surrounding structures eventually break down, the eco bricks can be removed and reused again and again, thanks to the long-life of plastic that makes it such an environmental hazard in the first place. Earlier this week, it was revealed that thousands of tonnes of mixed plastics which were meant for recycling are now set to be burned in Britain after councils shut their recycling banks. Start by segregating your ecobrickable plastic from all other materials. If there is any food, oil or dirt on your plastic, be sure to wash then dry. Dirty plastic inside an ecobrick will lead to microbiological growth and methane forming. Dirty plastic can lead to unsightly ecobricks, bloated bottles and in rare cases, caps popping off. Use a stick or spoon to push down the plastic around the inside of the bottle – move in a circle pushing down along the sides. To maximize the density, it’s good to mix soft, then hard plastic. Cut up big plastics into smaller pieces. The smaller the pieces, the denser you’ll get. A good minimum density is 0.33 g/ml. This means that a 600ml bottle will have a minimum weight of 200 grams and a 1500ml bottle will have a minimum weight of 500 grams. Minimum density goals are essential to ensure quality ecobricks. Quality ecobricks ensure good constructions, make the most of the volume and promote the social spread of ecobricks. Simply visit http://www.GoBrik.com, sign in with Facebook or email, create an account, then begin to log your ecobricks. GoBrik will do the rest– compiling stats for you and your community. The banks were used to collect yoghurt pots, margarine tubs, fruit punnets, plastic trays, bottle tops, cartons and takeaway coffee cups, which could not be put out with kerbside recycling. Local authorities used to sell the plastics abroad but a drop in demand from China – following a ban on importing foreign waste – means they are closing the banks. The world’s developing nations are currently scrambling for ways to process plastic refuse after China stopped accepting it.